4 October 2018 | International aviation is one of only two sectors not covered in the Paris Climate Agreement (the other is international shipping). Many airlines already use carbon offsets to limit their net carbon emissions, either on a voluntary basis or to comply with national or regional regulations. To date, there has been no unified effort to limit emissions from international air travel. Enter the Carbon Offsetting and Reduction Scheme for International Aviation (CORSIA), a program run by the International Civil Aviation Organization (ICAO) to limit carbon emissions from international aviation and meet the industry’s goal of achieving carbon-neutral growth beginning in 2020. Depending on how the sector grows in the coming years, CORSIA may generate between 1.6 and 3.7 billion metric tonnes of demand for offsets between 2021 and 2035. This could have major implications for the existing voluntary market for carbon offsets. How CORSIA affects those markets depends on how the recently-released Standards and Recommended Practices are rolled out, and yet-to-be-made decisions around what kinds of offsets will be eligible under the program. Here are some findings about CORSIA’s expected launch, as well as remaining questions about its impact on the voluntary market, culled from our recent report, Voluntary Carbon Market Insights: 2018 Outlook and First-Quarter Trends. You can also find a link to this infographic here. What can voluntary carbon offsets offer to CORSIA? Voluntary carbon offsets are strong candidates for inclusion in CORSIA. Currently, there are roughly 180 million tonnes of unsold voluntary carbon offsets, coming from projects in more than 80 countries. Project developers and investors are ready to scale up – but only if they receive the right signals from CORSIA. What kind of emissions units will be allowed in CORSIA? A Technical Advisory Body will screen and recommend eligible standards and offsets for approval by the ICAO Council. These standards might include voluntary standards, compliance standards, and/or REDD+ programs. They might also specify that only certain methodologies or project types with a standard or program are eligible. At the moment, few details are known about which standards, project types, or other criteria might be allowed for use in CORSIA. 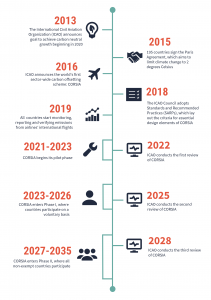 Until a final decision is made by the ICAO Council, voluntary carbon project developers won’t have a clear idea of whether they are eligible to provide emissions units to be used in CORSIA. What vintages will be allowed in CORSIA? Another key question is how new offsets must be (an offset’s age is called “vintage”). Countries home to many historical carbon offset projects typically prefer to keep vintages unrestricted, as this could help funnel more finance into their existing offset projects. Yet a number of other countries, especially those in the European Union, prefer stricter restrictions on offset age. What will happen to airlines’ existing offsetting activities? In a study of 129 of the largest airlines around the world, Ecosystem Marketplace found that 29 airlines offer offsetting to their customers, while 15 report voluntarily offsetting at least a portion of their own emissions. How CORSIA is designed and managed may impact whether airlines continue to be regulated under programs like the EU ETS, and whether they continue voluntary offsetting.